Vitamalt Shopping Spree winner Nicholas Robinson grabbed EC$841.48 in assorted groceries from the shelves of Randyâs Supermarket last week Friday. 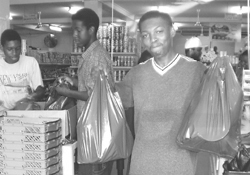 At the end of the 60 second shopping spree, Robinson, who is a student at the Teacherâs College, said he believed he had done his best. âI feel quite satisfied with the items that I picked up; I feel great,â he said. Robinson said that he occasionally drinks Vitamalt. Sales and Marketing Representative at the St.Vincent Brewery Dwight Stewart described the Vitamalt Krazy Krowns Promotion as a great success. He assured that the Brewery would come up with more exciting promotions to keep Vitamalt drinkers throughout the country happy. The first shopping spree was won by police constable Andre Hoyte who left the Bonadie Number Two Supermarket with EC$1200.80 in groceries.